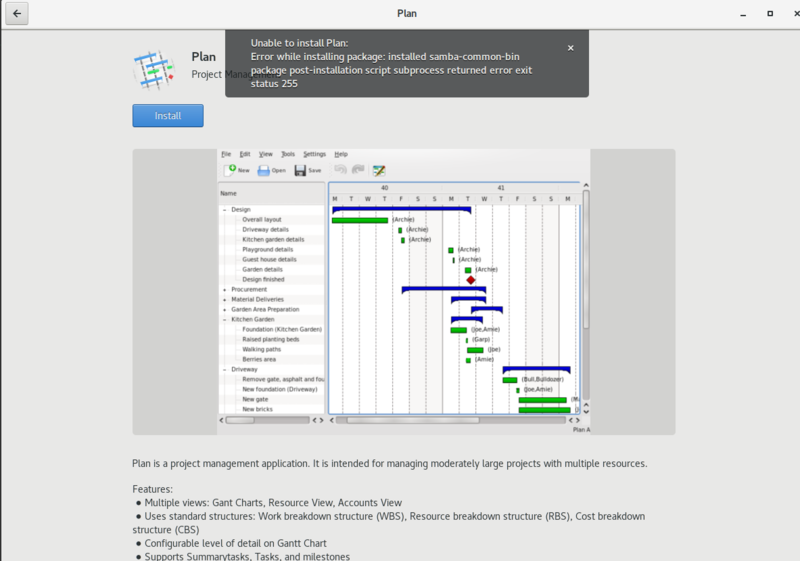 Installing "Plan" works fine for me. I suspect the installation failure here is a symptom of a different problem. Can you try and do an PureOS upgrade on the command line? ie. sudo apt update && sudo apt dist-upgrade and look specifically for any samba issues? Odd thing is when I went into the menu to open another application, "Plan" and "Plan Work package" are now installed and both launch despite all of the errors reported in this ticket. Please also attach/upload your entire dpkg.log - there be some very valuable context that we are missing due to you copy-pasting the bits you think are relevant. And your smb.conf please! Sorry, not sure why I didn't ask before given that the error message clearly says it is "invalid"
Thanks for the smb.conf. This has not been modified from the default but samba will choke on long hostnames (eg. librem15v3-enterprise-pureos). What I don't understand is why the long hostname would cause a problem with installing Plan and cause an invalid samba config. This has nothing to do with Plan. You just happened to hit/see it whilst installing Plan.